Lead halide perovskites have proved to be exceptionally efficient absorber materials for photovoltaics. Besides improving the properties of the perovskite absorbers, device engineering and the optimization of interfaces will be equally important to further the advancement of this emerging solar cell technology. Herein, we report a successful modification of the interface between the NiOx hole transport layer and the perovskite absorber layer using 4-bromobenzylphosphonic acid based self-assembled monolayers leading to an improved photovoltaic performance. The modification of the NiOx layer is carried out by dip coating which allows sufficient time for the self-assembly. The change in the surface free energy and the non-polar nature of the resulting surface is corroborated by contact angle measurements. X-ray photoelectron spectroscopy confirms the presence of phosphor and bromine on the NiOx surface. Furthermore, the resultant solar cells reveal increased photovoltage. For typical devices without and with modification, the photovoltage improves from 0.978 V to 1.029 V. The champion VOC observed was 1.099 V. The increment in photovoltage leads to improved power conversion efficiencies for the modified cells. The maximum power point tracking measurements of the devices show stable power output of the solar cells. Lead halide perovskite solar cells have reached certified power conversion efficiencies (PCEs) greater than 23% in a conventional n-i-p architecture [1, 2, 3]. Similarly, also with perovskite solar cells based on a planar inverted p-i-n architecture efficiencies greater than 20% have imposingly been realized [4, 5]. In addition, devices in inverted p-i-n architecture have piqued considerable interest as they offer the possibility to be processed at low temperature and also on flexible substrates [5, 6, 7]. The diminishing gap between the performance of both device architectures has been majorly possible due to optimizing the inorganic hole transport layers (HTLs). In particular, nickel oxide (NiOx) films proved to be promising, as they allow facile processing, good stability and efficient hole extraction [8, 9]. Furthermore, different doping procedures for NiOx such as incorporation of copper, cesium or silver ions have led to improved device performance and are opening up pathways for further optimisations [10, 11, 12]. In recent practice, the NiOx layers for the application in perovskite solar cells are deposited majorly via solution processes by using sol–gel methods or nanoparticle dispersions in water [10, 13, 14, 15, 16, 17, 18, 19]. Moreover, atomic layer deposition, flame spray synthesis, pulsed laser deposition, sputtering and electrodeposition have been applied for the formation of NiOx thin films [20, 21, 22, 23, 24, 25]. In photovoltaics, interface engineering between charge transport layers and the absorber layer is an important approach in device optimization. 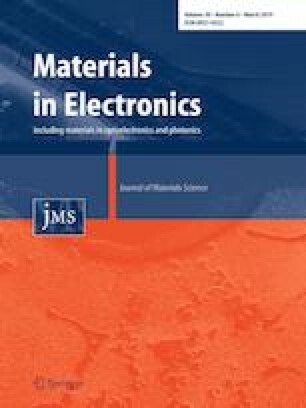 One of the primary concepts utilized to achieve such engineering is the application of self-assembled monolayers (SAMs) [26, 27, 28]. The formation of a monolayer and the effective dipole of the applied molecules can be explored for designing the properties at the aforementioned interface. The SAMs allow the manipulation of the work function and the wettability of the metal oxide films, and they can also passivate the interface [29, 30]. For example, Wang et al. reported on the effects of para-substituted benzoic acid SAMs on the NiOx and perovskite interface. They highlighted an improved open circuit voltage (VOC) due to the introduction of bromobenzoic acid (dipole moment of 2.1 D) as a monolayer on the NiOx film . In this work, we discuss the influence of the modification of the NiOx HTL with 4-bromobenzylphosphonic acid (Br-BPA) on lead halide perovskite solar cells. We chose phosphonic acids as the interface modifier as they have so far been barely investigated in perovskite solar cells even though they have been thoroughly studied in organic field effect transistors as well as organic photovoltaics and possess beneficial properties for surface modification of metal oxides . In a study on the modification of zinc oxide (ZnO) with benzylphosphonic acids (BPA), Lange et al. reported that BPA SAMs have a preferential tridentate binding on a ZnO surface. A tridentate binding suggests a stronger chemisorption of the SAM molecules on the metal oxide surface in comparison to the mono- and bi-dentate binding [32, 33, 34, 35]. As absorber layer for the solar cells prepared in p-i-n architecture, a triple cation based perovskite with the composition Cs0.1(FA0.83MA0.17)0.9Pb(I0.83Br0.17)3, introduced by Saliba et al. , was selected. All chemicals and solvents were used as purchased without any further purification. Nickel(II) nitrate hexahydrate and sodium hydroxide was purchased from Fluka and VWR, respectively. Lead iodide, lead bromide, formamidinium iodide and PC60BM were purchased from TCI, Alfa Aesar, GreatCell Solar and Solenne, respectively. The other chemicals used in this study, including the phosphonic acid molecule, and all the solvents were purchased from Merck (Sigma Aldrich). The synthesis of the NiOx nanoparticles was performed according to previous reports [15, 37, 38, 39]. In brief, nickel (II) nitrate hexahydrate (NiNO3 · 6 H2O) (0.05 mol) was dispersed in 10 mL deionized water and stirred for 5 min. Afterwards sodium hydroxide (NaOH, 10 mmol/mL) was added dropwise to adjust a pH of 10, which results in a colour change from dark to light green. The colloidal precipitate was then washed with deionized water to remove side products. The light green residue was further dried at 80 °C for 6 h followed by calcination at 270 °C for 2 h. This resulted in non-stoichiometric black nickel (II) oxide nanoparticles. The X-ray diffraction (XRD) pattern of the NiOx nanoparticles is very similar to as reported in Ref. and reveals reflections at 37.2°, 43.2°, 62.7°, 75.4° and 79.3° 2θ, which correspond to the (111), (200), (220), (311), and (222) lattice planes in a cubic crystal structure. An estimation of the primary crystallite size based on the peak broadening via Scherrer formula led to a value of approx. 8 nm. For the preparation of the NiOx ink, 20 mg/mL of the NiOx nanoparticles were dispersed in deionized water. The ink was put in an ultrasonic bath for 2 h and then filtered using a 0.45 µm PVDF syringe filter. Pre-patterned glass/ITO substrates (15 × 15 × 1.1 mm3) (15 Ω/sq) from Luminescence Technology Corp. (Lumtec) were carefully wiped using acetone before putting them into an isopropanol bath. The bath was further subjected to an ultrasonic bath for 10 min. The substrates were then dried using in an N2 stream. Just before spin coating the NiOx nanoparticle ink, the substrates were plasma etched using oxygen plasma for 3 min. The NiOx nanoparticle ink was spin coated onto the glass/ITO substrates at a speed of 1000 rpm. Before the determination of the layer thickness and solar cell preparation, the films were allowed to dry in ambient conditions for 3 days. The as-prepared films revealed an average thickness distribution of ~ 25 nm. A 5 mmol/mL solution of Br-BPA was prepared in acetonitrile and was filtered using a 0.45 µm PVDF syringe filter. The application of the Br-BPA molecule was done by dip coating. In the dip coating method, the glass/ITO/NiOx substrates were dipped in the phosphonic acid solution for 1 min to allow adsorption. These substrates were then cleaned by dipping them in fresh acetonitrile solvent to allow removal of non-adsorbed phosphonic acid molecules from the modified surface. The substrates were then dried in an N2 stream. The deposition was carried out in ambient conditions. The cesium, formamidinium, and methylammonium based triple cation lead halide perovskite absorber layer was adapted from Saliba et al. . The final composition chosen was Cs0.1(FA0.83MA0.17)0.9Pb(I0.83Br0.17)3. The precursor solution consisted of 1 mmol/mL formamidinium iodide (FAI), 1.1 mmol/mL PbI2, 0.2 mmol/mL methylammonium bromide (MABr), and 0.2 mmol/mL PbBr2 in a mixed dimethyl formamide (DMF)/dimethyl sulfoxide (DMSO) solvent with a 4:1 volume ratio. To this solution, 1.5 mmol/mL CsI in DMSO, was added to obtain a 10% Cs content. The final precursor solution was stirred overnight in inert conditions to allow sufficient reaction time. The solution was then filtered using a 0.45 µm PTFE syringe filter prior to spin coating. The perovskite absorber layer was spin coated on the non-modified and modified glass/ITO/NiOx substrates in a two-step spin coating process with 1000/6000 rpm for 10/20 s. In the last 5 s of spinning, chlorobenzene was dripped onto the substrate as an antisolvent. The substrates were annealed at 100 °C for 1 h. The thickness of the perovskite absorber layers was monitored using a Stylus profilometer and was found to be approximately 485 nm. A phenyl-C61-butyric acid methyl ester (PC60BM) solution in chlorobenzene having a concentration of 20 mg/mL was prepared. The solution was stirred overnight and filtered using a 0.45 µm PTFE syringe filter prior to spin coating at 4000 rpm for 20 s. In a last step of the solar cell preparation, a 120 nm thick silver layer was deposited by thermal evaporation on top of the PC60BM layer at an evaporation rate of 1–2 Å s−1 using a shadow mask (0.09 cm2). XRD was performed on a PANalytical Empyrean system using Cu Kα radiation. Ultraviolet–visible (UV–Vis) spectroscopy measurements were done using the UV–Vis Spectrometer—Lambda 35 by Perkin Elmer. The layer thicknesses were measured by surface profilometry using a DektakXT device by Bruker and the surface morphology of the perovskite films was characterized by scanning electron microscopy (SEM) images acquired on a Zeiss-Supra 40 scanning electron microscope with an in-lens detector and 5 kV acceleration voltage. Contact angle measurements of the NiOx films before and after the modification with Br-BPA were carried out on a Krüss DSA100 system using water and ethylene glycol as liquids. The surface free energy calculations were performed with the Owens-Wendt-Rabel & Kaelble method  using the Krüss Advance software. X-ray photoelectron spectroscopy (XPS) measurements of the NiOx and NiOx/Br-BPA SAM films were recorded using a multiprobe surface analysis system (Omicron Nanotechnology) equipped with a DAR 400 X-ray source (Al Kα1 radiation, 1486.7 eV), an XM 500 quartz crystal monochromator (energy width: 0.15 eV), and an EA 125 hemispherical electron energy analyzer based on a 5-channel pulse counting channeltron. The current density–voltage (JV) curves and maximum power point (MPP) tracking measurements of the solar cells were performed using a Keithley 2400 source meter and a LabView-based software inside a glove box (nitrogen atmosphere). For the JV curves, the scan rates were adjusted to 100 mVs−1 in the forward (fwd) direction (− 0.02 V to 1.2 V) and backward (bwd) direction (1.2 V to − 0.02 V) for both light and dark measurements. The illumination area was defined using a shadow mask (0.07 cm2) and the light was provided by a Dedolight DLH500 lamp calibrated to an intensity of 100 mWcm−2 using a pyranometer from Kipp & Zonen. The External Quantum Efficiency (EQE) spectra were acquired using a MuLTImode 4 monochromator (Amko) equipped with a 75 W xenon lamp (LPS 210-U, Amko), a lock-in amplifier (Stanford Research Systems, Model SR830), and a Keithley 2400 source meter. The monochromatic light was chopped at a frequency of 30 Hz and the measurement setup was spectrally calibrated with a silicon photodiode (Newport Corporation, 818-UV/DB). The modification of the NiOx thin films with Br-BPA was performed by dipping the films into an acetonitrile solution containing the Br-BPA molecules followed by washing the substrates in pure acetonitrile. A detailed description of the procedure can be found in the experimental part. The chemical structure of Br-BPA and a schematic illustration of the modification together with the used solar cell setup to investigate the influence of the modification on the photovoltaic performance are shown in Fig. 1a. During the dipping process, the phosphonic acid groups bind to the NiOx surface whereby the Br-BPA molecules very likely form a SAM. Thereby, on the one hand the surface will become more non-polar due to the Br functionality which might influence wetting of the perovskite precursor solution and the crystallisation properties of the perovskite films. On the other hand, the Br-BPA molecule has a dipole moment of 2.3 D , which can facilitate charge extraction and also reduce the valence band energy of the NiOx film, similar to as it was experimentally and theoretically shown for the modification of ZnO surfaces [30, 32, 34, 35]. As a first step, the presence of a Br-BPA SAM and the modification of the surface properties of the NiOx films were confirmed by contact angle measurements. Figure 2 shows the changes in the shape of water and ethylene glycol drops on the non-modified and modified NiOx films. The corresponding values of the contact angles are summarized in Table 1. 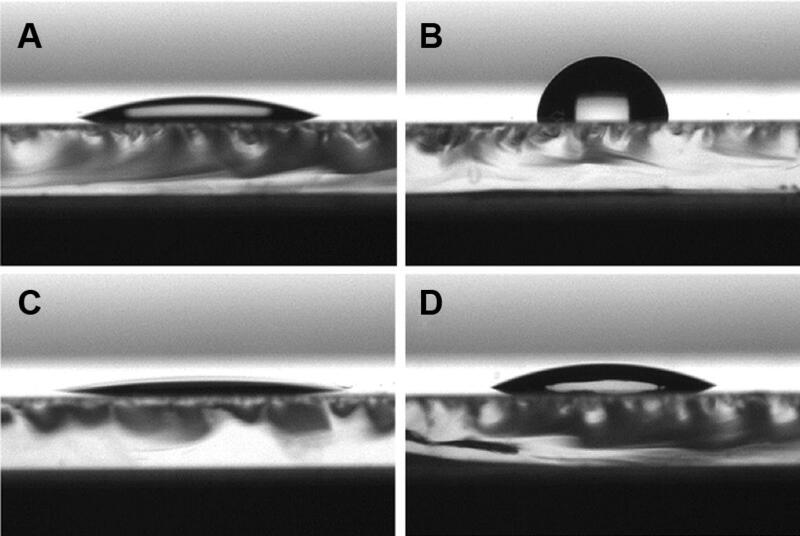 It is apparent that the contact angle of water is significantly increased from 21.9° to 93.1° due to the Br-BPA modification indicating a rise in the hydrophobicity of the surface. The high contact angle of water after the modification also indicates a dense coverage of the NiOx surface with the Br-BPA molecules. To calculate the surface free energy of the films, additional contact angle measurements with ethylene glycol were performed showing an increase from 15.8° to 24.3° due to the introduction of the Br-BPA SAM. The surface free energy of the NiOx film was calculated to be 88.4 mN m−1 with a very low disperse part of 0.47 mN m−1 and a polar part of 88.0 mN m−1. After the modification, a value of 126.5 mN m−1 was obtained and the polarity changed completely to a disperse part of 120.9 mN m−1 and a polar part of 5.6 mN m−1. This indicates a successful incorporation of the Br-BPA molecules on the surface of the NiOx layers and the corresponding change in surface properties. In order to confirm the presence of the phosphonic acid molecules at the surface of the NiOx film, we performed XPS measurements. 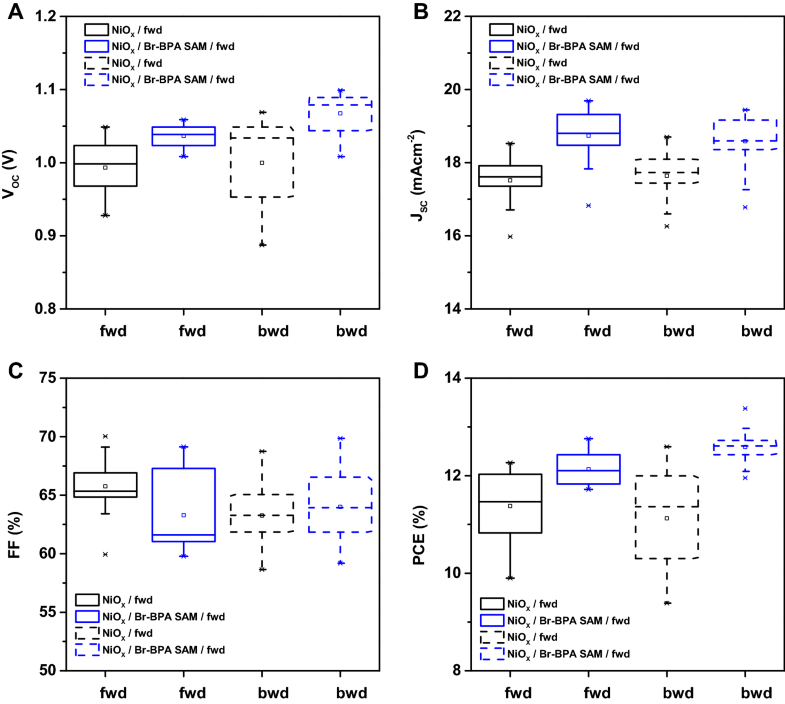 The survey XPS spectra of the non-modified and modified NiOx films are shown in Fig. 3a and b. The high peak intensities of indium (In) and tin (Sn) are indicating that the NiOx layer is at least in some parts only a few nanometres thin. Due to the high surface sensitivity of this technique, we detect the P 2p doublet of the phosphonic acid at 132.5 eV and the Br 3p doublet at 183 and 190 eV in the modified sample, while these peaks are absent in the reference sample (Fig. 3c). The signal at 284 eV can be assigned to the C 1s peak and is increased with the presence of the SAM molecules. The corresponding high-resolution XPS core-level spectra are given in the Fig. 3d and e. Peak fits were performed by using a convolution of a Gaussian and a Lorentzian profile. The inelastic mean free path of the photoelectrons (λ) is dependent on the kinetic energy of the photoelectrons and the layer material. The values of λ were determined from the Tanuma, Powell, and Penn TPP2 M formula  and the software QUASES written by Sven Tougaard. θ is the detection angle relative to the surface normal. For a given layer system, in our case ITO/NiOx/Br-BPA, the expected total photoelectron intensity of each element can be calculated by the signal sum over all atomic layers including the atomic density of the element in the layer. The layer model was optimized for the best matching of the calculated contribution of each element with the element quantification of the measured spectra at all detection angles. We found a good agreement between the measured and calculated data by assumption of a NiOx nanoparticle layer with an average thickness of around 5 nm on the ITO and a Br-BPA SAM-layer with a density of 4 molecules per nm2. This matches well with previously reported surface coverage densities of phosphonic acid molecules on metal oxides [35, 43]. Previous studies on NiOx HTLs for perovskite solar cells revealed that NiOx film thicknesses of around 25 nm are beneficial for the solar cell performance. Therefore, we adjusted the thickness of the NiOx films used in the solar cells in the further course of the study by optimizing the spin coating parameters [10, 11, 15, 31]. In the next step, we investigated the effects of the Br-BPA SAM on the properties of the perovskite thin film. Figure 4a shows the XRD pattern of the Cs0.1(MA0.17FA0.83)0.9Pb(I0.83Br0.17)3 perovskite films prepared on non-modified and modified NiOx films. Both samples show the typical pattern of the cubic perovskite crystal structure with characteristic peaks at 14.1° and 28.4° for the (110) and (220) lattice planes along with peaks at 20.0°, 24.5°, 31.8°, 40.6° and 43.2° 2θ, which matches well with literature data [36, 44, 45]. Furthermore, the intensity ratios of the peaks in the non-modified sample are very similar to the ones in the modified sample indicating no change in orientation of the perovskite crystals relative to the substrate. The peaks at 35.0° and 50.2° 2θ stem from the ITO substrate. The minor peak at 12.7° 2θ indicates small amounts of PbI2 in the films. 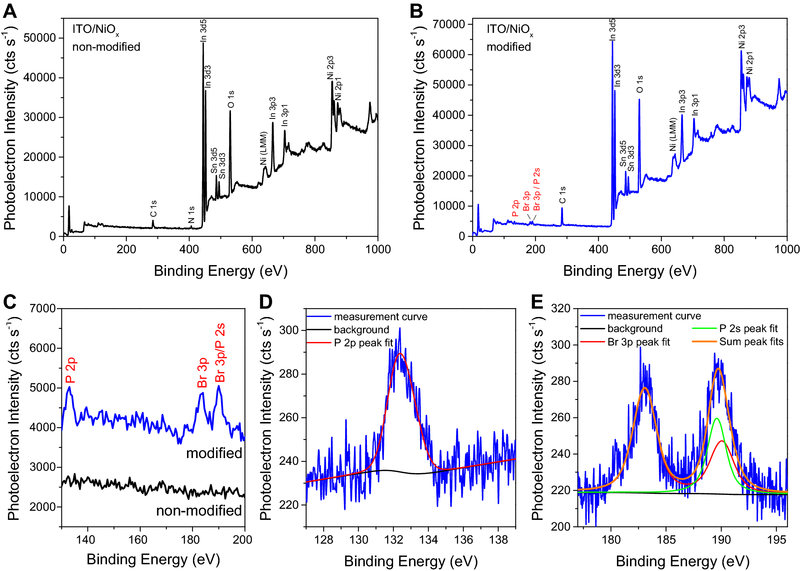 A minor excess of PbI2 was reported to improve the properties of the grain boundaries and to suppress non-radiative charge carrier recombination in the perovskite films [46, 47]. The absorption spectra of the perovskite films suggest a similar absorption onset (~ 770 nm) in agreement with a bandgap of ~ 1.61 eV [36, 45]. The slight differences in the intensity of the absorption spectrum stem from minor changes in the film thickness. The surface profile measurements revealed film thicknesses of the perovskite layers between 485 and 510 nm independent of the surface modification. Furthermore, the surface morphology of the perovskite films prepared on glass/ITO/NiOx substrates without and with Br-BPA modification was investigated by scanning electron microscopy. The top view images depicted in Fig. 5 reveal homogeneous perovskite films and their complete coverage of the NiOx films. The grain sizes range from 125 to 135 nm for the smaller sized grains to approximately 475–510 nm for the larger ones and no significant changes based on the surface modification are noticed. To evaluate the influences of the modification on the photovoltaic performance, solar cells with the device architecture glass/ITO/NiOx/perovskite/PC60BM/Ag (cf. scheme in Fig. 1a) were prepared. A schematic energy band diagram based on the values published in literature [48, 49, 50, 51] is shown in Fig. 1b. The Fermi level has been chosen as the reference energy level instead of the vacuum level since this is more suited to describe non-ideal systems such as the herein discussed devices . The JV curves of typical solar cells without and with Br-BPA modification measured in fwd and bwd direction are presented in Fig. 6a. The corresponding characteristic parameters are summarized in Table 2. The most obvious change in the photovoltaic properties is the enhanced photovoltage in the devices with the Br-BPA modification. 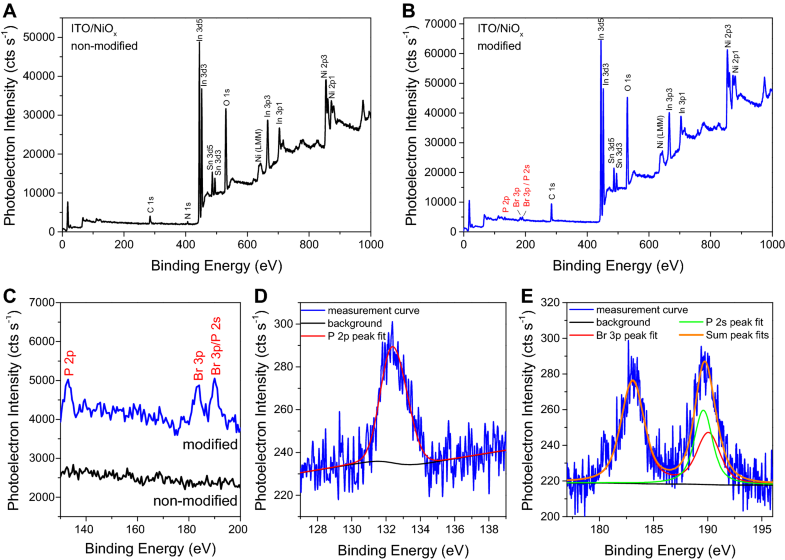 In these solar cells, the VOC is increased from 0.978 V to 1.019-1.029 V. This increase in VOC resonates with previous reports investigating benzoic acids for the NiOx modification and originates most presumably from the lowering of the valence band energy of the NiOx films by the surface modification . Moreover, there is a slight increase in short circuit current density (JSC) detectable for the solar cells with Br-BPA modification which can be attributed to the dipole moment of the molecule. whereby, Jbwd (V) indicates the area of the JV curve for the backward scan and Jfwd (V) indicates the area for the forward scan in the region between short circuit (SC) and open circuit (OC) conditions. This equation was adapted from Ref. which considers the integrated power output of the solar cells in fwd (SC to OC) and bwd (OC to SC) scan directions. Based on Nemnes et al. [53, 54, 55] this method is useful for the determination of the HI for normal and inverted hysteresis in non-crossing JV curves. If the HI approaches 0, the solar cell would have negligible hysteresis. For the typical solar cells shown, we calculated an HI of − 0.0562 for the device with the non-modified NiOx layer and the HI is slightly reduced to − 0.0131 for the solar cell with the modified NiOx HTL. The MPP tracking measurements (Fig. 6b) reveal a constant power output of the solar cells. While the voltage at the MPP (VMPP) is slightly decreasing at the beginning of the measurement, the current density at the MPP (JMPP) improves slightly leading to a constant power output and a PCE of 11.4% and 12.2% for the non-modified and the modified device after 10 min of continuous illumination, respectively. The EQE spectra (Fig. 6c) for the representative devices show a typical shape of perovskite solar cells with an onset at 770 nm and a characteristic plateau at wavelengths below 750 nm. Moreover, the spectra remain almost unchanged upon the modification of the NiOx HTL. This is expected, as the JSC for the representative devices are rather similar. The integrated JSC calculated from the EQE spectrum sums up to 18.2 and 18.4 mA/cm2 and is within a few percent deviation to the values extracted from the JV curves. The statistical data of the 20 best solar cells (non-modified and modified separately) prepared within this study are shown using box plots in Fig. 7. These data support the discussion above. Figure 7 reveals that the VOC of the solar cells is enhanced in both scan directions; also the average JSC is slightly improved. Regarding the fill factor (FF), there is no major change observed. This results in an average increase in PCE from 11.4 ± 0.7% (11.1 ± 1.1%) to 12.1 ± 0.3% (12.6 ± 0.3%) for the Br-BPA modification based solar cells in fwd (bwd) scan directions, respectively. With the Br-BPA modification, we observed VOCs of up to 1.1 V in this study. The JV curves of such a solar cell are shown in Fig. 8. In bwd scan direction a VOC of 1.099 V was obtained corroborating the potential of this modification strategy. The EQE spectrum reveals values up to 87.9% and the derived integrated JSC (19.55 mA cm−2) shows consistency with the JSC observed in the JV curve. The PCE of this solar cell was at 12.7%. In summary, we successfully functionalized solution processed NiOx HTLs by a dip coating procedure using a Br-BPA solution in acetonitrile. This is substantiated by the markedly increased contact angle of water, the surface free energies and the detection of P 2p and Br 3p peaks in the modified sample by XPS measurements. We did not observe any notable change in the optical properties and surface morphology of the perovskite layers. However, the JV curves reflect improved photovoltaic performance, particularly an increased VOC. A typical device shows an improved PCE from 11.2% (10.8%) to 12.5% (12.7%) due to an improved VOC from 0.978 V (0.978 V) to 1.019 V (1.029 V) in fwd (bwd) scan directions, respectively. We assume that the improvement in the VOC is largely due to the realignment of the energy levels based on the dipole moment of the Br-BPA SAM molecules. With devices having Br-BPA modifications, VOCs of up to 1.099 V could be obtained. Furthermore, MPP tracking measurements revealed a steady state PCE of 11.35% and 12.22% for typical devices without and with Br-BPA modified NiOx films. Open access funding provided by Graz University of Technology. This work was carried out within the project “flex!PV_2.0” (FFG No. 853603) funded by the Austrian Climate and Energy Fund within the program Energy Emission Austria. Birgit Ehmann is gratefully acknowledged for experimental support.